Good Morning! I'm posting early today beause I have lots to get done plus my son is home sick from school again today. This cold is going through my enitre family now, it's that time of year I guess. Today I wanted to share the thank you card I made for my daughter's birthday party last week. I wanted to make cards that were quick and easy to make. I rarely make OLC (or one layer cards), but I thought it would be a good opportunity to give it a try. This is a retired stamp set I purchased last year from the mini catalog. I just love this Watercolor Trio stamp set and I'm secretly hoping that Stampin' Up! will put this set in the new catalog- they probably won't but it's wishful thinking right? 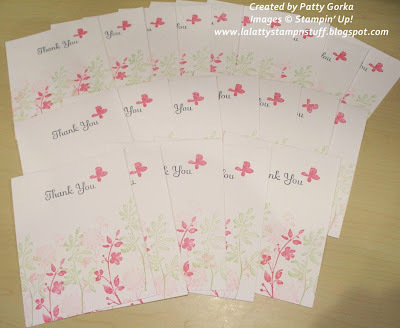 There was no special technique to making these cards, I simply cut my sheet of card stock in half, folded them in half to make my card and then I just stamped the flowers, leaves along the bottom of my card. The sentiment I stamped towards the top in the center and lastly I stamped the butterfly just above and to the right of my thank you sentiment. I didn't even use my stamp-a-ma-jig to stamp these cards, I just inked up my stamps and stamped. Seriously, these cards were so easy to make, I had 22 of them whipped up in just over an hour! You were rockin' those stamps! Love your cards! Hope your son gets to feeling better quickly. they are certainly great looking cards. i might have to try that sometime. the colors are great. I just love that melon mambo. 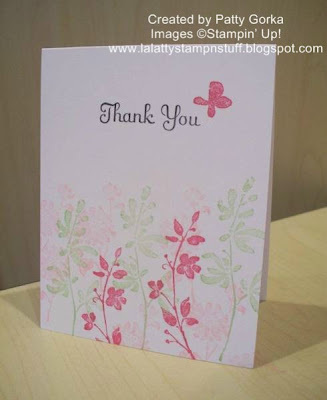 AWESOME one layer card! They are sooo pretty! Lovely cards! Great colors! Beautiful and quick! Very pretty! I love the soft pastels and the single layer card.